prepared in a smoker oven. Our unique production methods make our products the best in the world. We have designed, developed and constructed our production technology ourselves, to ensure the integrity and quality of Lappi products. The Surprising Taste of Lappi products can always be recognised by their mouth-watering, lingering, and inimitable world of flavours. We still prepare our products by hand, utilising modern technology, and giving due respect to recipes and traditions which have been in the family for many generations. 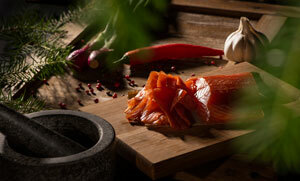 We only use the best, selected Finnish rainbow trout, raised in the cleanest waters in the world, in Finland. Top-class ingredients, traditional work performed by hand, and careful quality control, combined with the latest top technology, ensure the production of high-class products of which we can be genuinely proud. 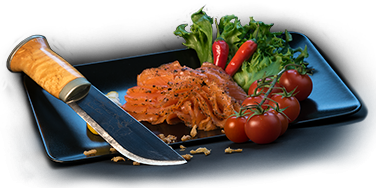 This fresh, boneless Finnish rainbow trout is prepared using professional, traditional methods. 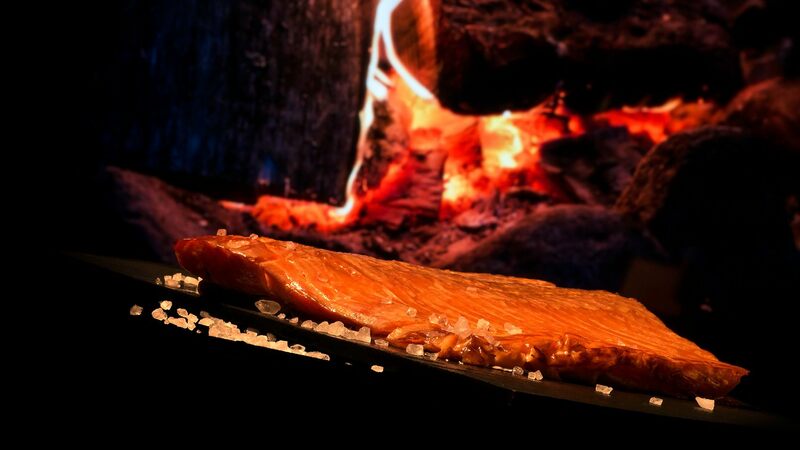 The surface of the fish is salted with top-quality sea salt and the fish is then cold-smoked slowly for three days, in genuine alder smoke, at 3°C. Lappi Gravad gets its forest-fresh Finnish flavour from top-quality sea salt, pink peppercorns and the mesmerising juniper berry. We are proud of our flavouring process, which is still performed by hand; the exact details of the preparation process are a tightly guarded secret in our family. This ensures the uniqueness of our products. Let the Lappi Enchantment cold-smoked trout tartare caress your taste buds, and experience a genuine, mouth-watering flavour experience. 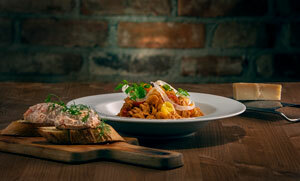 There is lots of genuine Lappi cold-smoked trout in the tartare. And of course, 100% flavour! Serve it as it is or combine it in many ways while cooking. The product can be used in such diverse ways that only your own imagination sets the limits for its use in cooking. 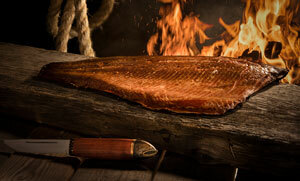 The unique flavour of Lappi Fire Smoke is guaranteed by a method where fresh Finnish rainbow trout are cooked through, until aromatic, by a genuine smoky fire. 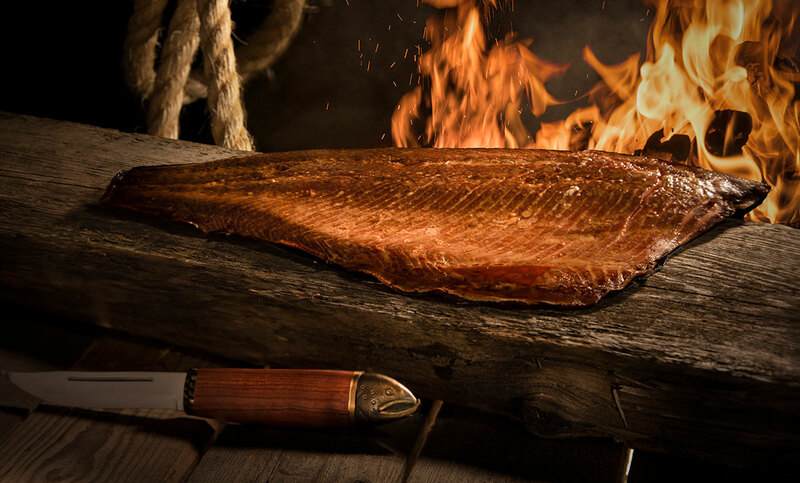 The flaming fire and the alder smoke which gently caresses the surface of the fish give the product a supreme, lingering flavour, even giving you a sense of the fire. the trout is smoked for three days, at 3°C. In order to prepare a high-quality product you need to take your time. This offers a guarantee of a refined taste and a mouth-watering consistency. The flaming fire and the alder smoke which gently caresses the surface of the fish give the product a supreme, lingering flavour. It’s a great way to stay up-to-date with our current offers and events. 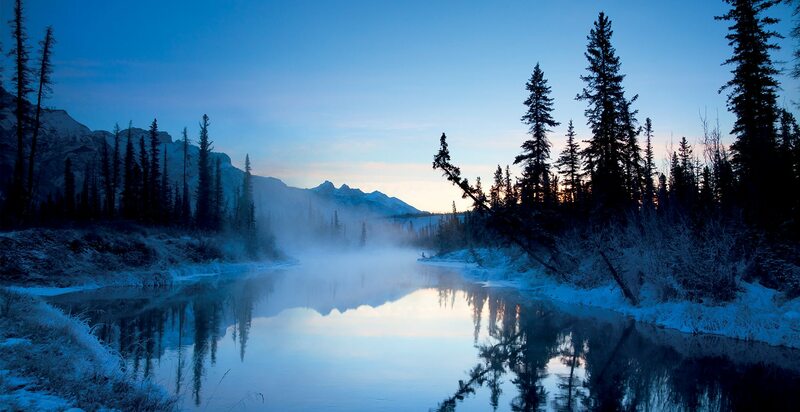 Vesa Lappi grew up to the enchanting scent of alder smoke. Vesa’s father and grandfather were both enthusiastic fishermen and fish smokers. Inspired by great childhood memories, an idea started to form... .
At the end of autumn 2013, flakes of ice were already piling up on the shores of Suvasvesi, in Kallavesi, and sleet was coming in horizontally, as the fishing day concluded and day turned to dusk. It was at that point that Vesa realised his calling: his hobby and everything associated with it – passion, know-how and fish-processing skills – could be made into a profession. That’s how Kala-Lappi Oy and its unique, mouth-watering world of flavours started. In the processing of the fish, Vesa has further developed the traditional crafts skills of four generations by utilising modern technology. 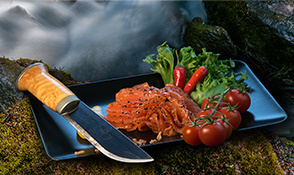 This has resulted in a completely unique cold-smoked Finnish rainbow trout, as well as other unique Kala-Lappi products, with a new world of flavours. In Kala-Lappi’s activities and products, naturalness, authenticity, passion, integrity and a determination to follow one’s own path are emphasised, not forgetting traditions. The market has welcomed Kala-Lappi products with great enthusiasm, and growth is continuing at dizzying speed. Would you like to be kept up-to-date with the new and innovative products that Kala-Lappi is bringing to market next? Enjoy our products, follow us on various platforms, and be prepared for tasty, delicious surprises! Our customers’ opinions are very important to us. With the help of feedback, we can develop products and services to better accommodate your wishes. We are happy to answer any questions related to Kala-Lappi products.